It’s not hard to see why solar panels can be cool. Free energy from the sun, received wirelessly from anywhere? You don’t even have to be some kind of camping fanatic to see the potential there. 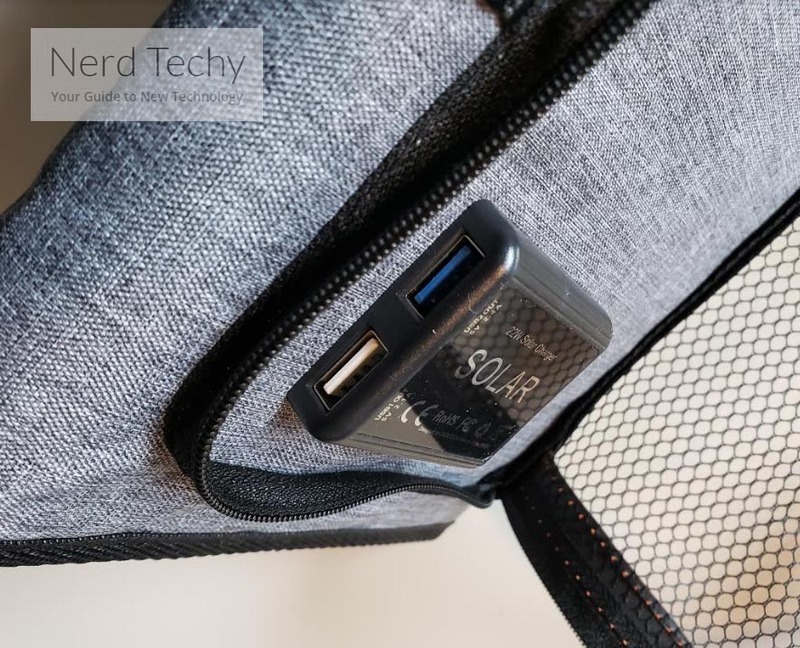 But if you are someone who spends a lot of time away from the grid, having the right portable solar charger means a bottomless supply of power. Far more than you could ever draw from a portable power bank. Though a power bank and a portable solar charger work excellently in combination. Nevertheless, it can be tricky to choose solar chargers because solar panels aren’t something most people are familiar with evaluating. Want to power up your favorite mobile devices? It turns out you need a surprising amount of energy. If you were trying to power your smartphone with a few AA batteries, you’d be going through multiple sets every day. Because you need considerable amounts of power to fire-up your electronics, that also means you need larger solar panels. Because there’s a direct relationship between the size of the panel and how much energy it can collect for you. When it comes to solar panels, bigger is almost always better. Because when the weather gets a little poor, and the output of your panel suddenly drops by 50%, you need every square inch you can get. On a cloudy day, a small panel may not be able to power anything. If you’re using a larger panel, you’re in a totally different situation, though you’re never totally immune from the whims of the weather. Sure, you should go big. But size can make it difficult to keep your solar panels portable. After all, how do you carry around a few feet of solar paneling? The Choetech (Model SC005) 24W Portable Solar Charger is basically an answer to that question. They’ve gone and attached four large solar panels to a bendable and foldable cloth surface. 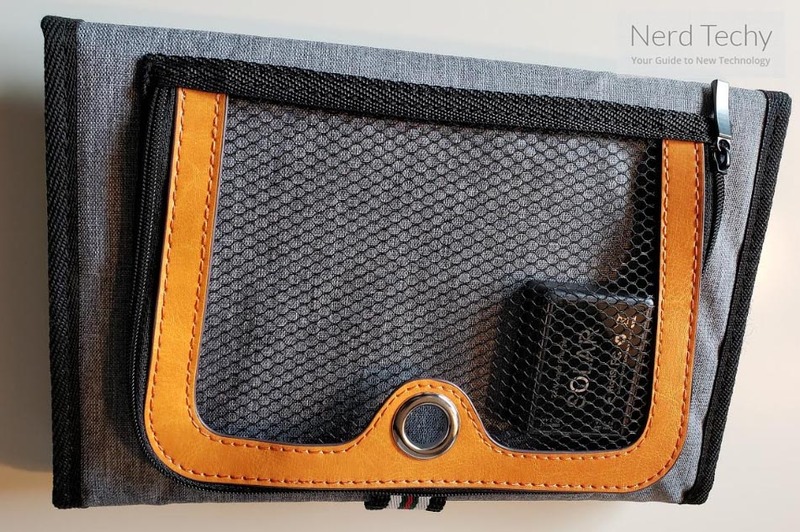 When everything is tucked away, their portable solar charger actually lives up to its claims of portability. They’re not even hard to carry around. How well do they perform their job as a charger? Well, this panel is supposed to be able to convert about a quarter of the sun’s power in to energy. These days, that’s about standard for panels of this quality. Though compared to only a few decades ago, that’s an incredible achievement. Solar technology has come a long way in a short time. The Choetech supposedly can take that one quarter-efficiency and use it to power two USB devices at the same time. But can it get the job done? One of the first things you’ll notice about this device is the generally high quality of its construction. It’s like you can just sense it by having it in your hands. But if you actually look carefully at the material, you’ll find that sense of ruggedness isn’t just a feeling. The construction centers around built-in EVA. The rest of the materials are mostly pure copper for non-rusting, TPT, and PET. Basically, the same kind of stuff you would use while constructing quality home-tier solar panels, the sort that are made to sit outside in the elements all day. Consequently, that combination of materials helps make these panels fairly well protected against water. Still, you probably wouldn’t want to throw them into a pool. But for the kind of environmental conditions you might encounter in the places where solar panels are used, these panels are well equipped to survive and thrive. 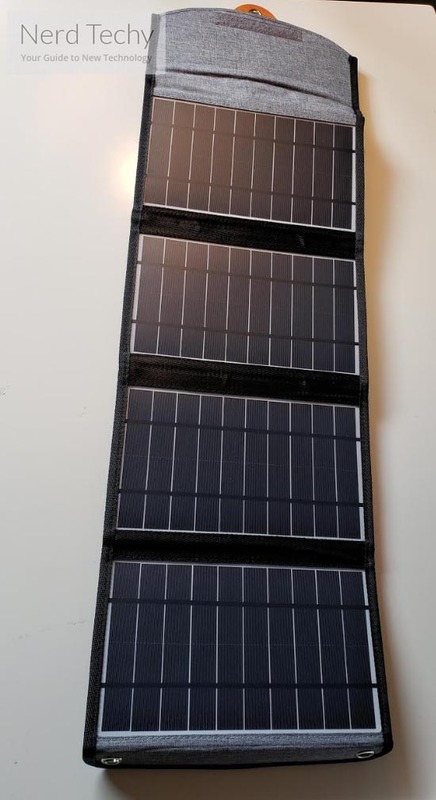 Again, like many other high-quality solar panels, these panels are constructed with an anti-scratch finish. That helps to keep each panel in good health as dust and debris blow over it, which allows you to use this charger outside with confidence. Even when the weather is a little sub optimal. Though obviously if something like hurricane conditions began to come through, you would want to pull the solar panel to safer ground, taking full advantage of its portability. Before talking more about the portability, it’s worth mentioning the charger has a pair of USB charging ports on the end side. 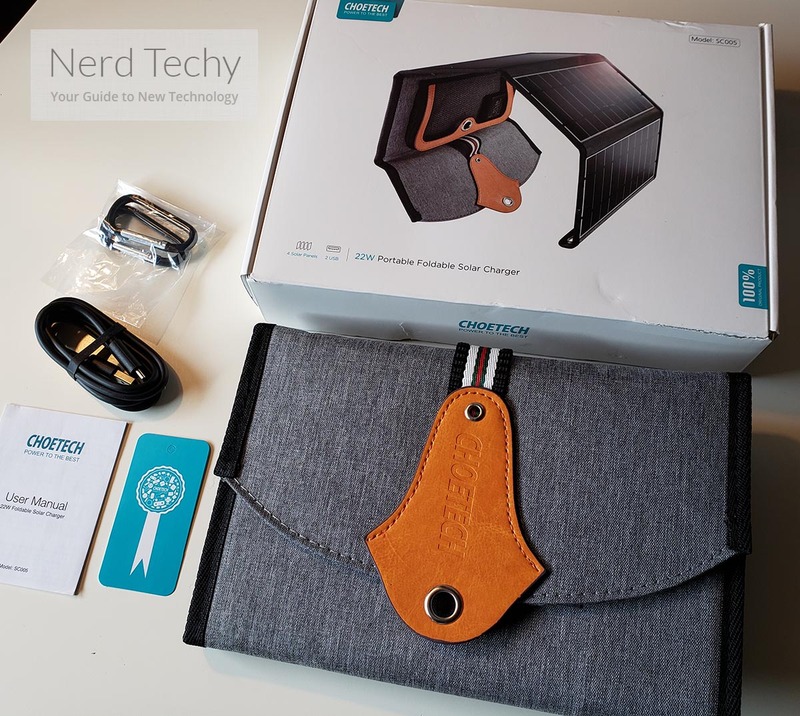 They’re made to be equally powerful, and made to be used concurrently so you don’t need to think about prioritizing the devices connected to the Choetech Portable Solar Charger. Additionally, there’s no need to plug or unplug your devices as sunlight comes and goes. Because the charger includes some basic intelligent circuitry that can help determine when your devices need to be charged, and when they’ve been filled up. In short, that means you don’t have to worry about overcharge damage from keeping your stuff plugged in. It’s a good thing these panels are so rugged. Not only because they were made to be used outdoors, but because they were intended to be dragged around from one location to the next. Which is why these panels were made so incredibly portable. Their design can be folded away because each panel is positioned on a fabric surface. The fabric is actually a waterproof nylon, which can help protect the panels from spills and the like. 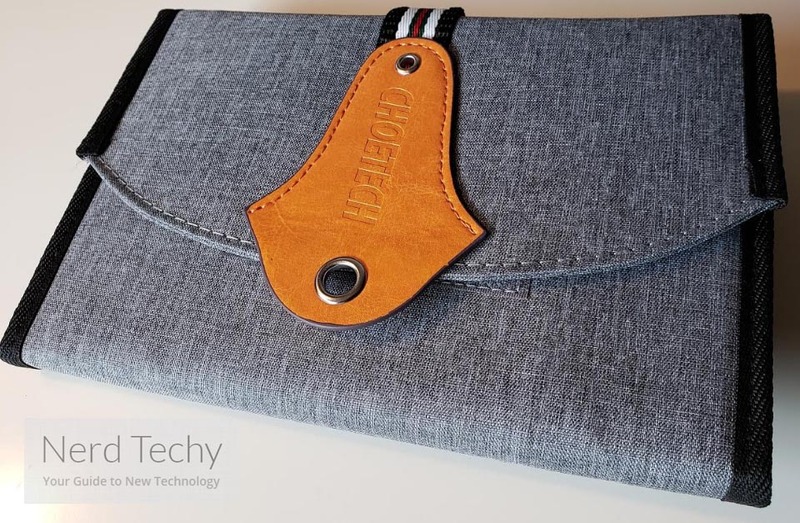 The fabric also serves to act as a bag for other electronics you might want to carry with the charger. 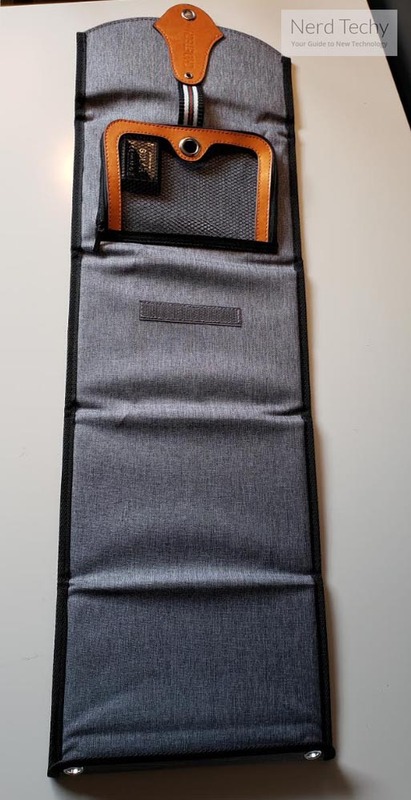 For instance, there’s an LED power indicator and a phone bag capable of carrying about three smartphones inside. 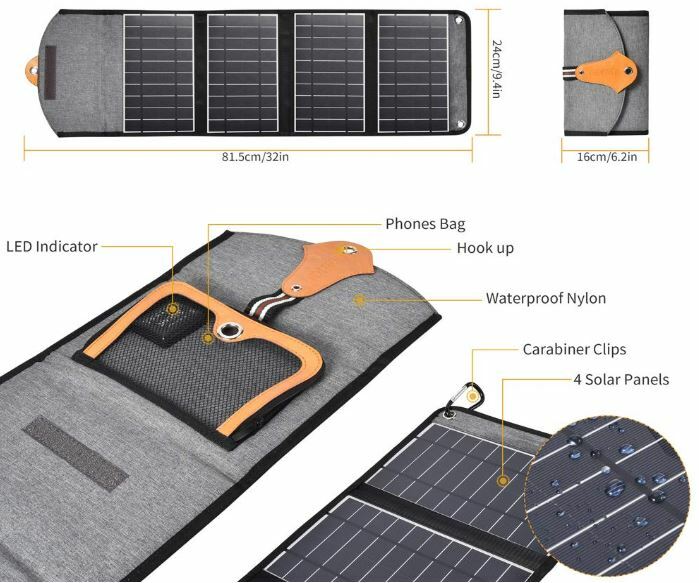 Even though it’s based on a foundation of fabric, this solar charger has portability that’s more like a map made of paper. Or perhaps a large board game board that folds out. Things really only fold in one direction, and that matters when it comes time to put things away. But once everything is wrapped up, you can use a Velcro seal to keep the panels from unfolding themselves into disarray. Quite handy. Apart from folding up nicely, the exterior of the device provides a carabiner clip that can be used for hanging or carrying. They actually made this clip knowing that it had to support the weight of the device, so it’s rather sturdy. Without destroying a charger to find out, I’d estimate it can sustain over 60lbs of force. The CHOETECH 24W Portable Solar Charger was made to work alongside virtually any 5V USB device. For smartphones, that includes Sony phones, Huawei phones, Samsung phones, and of course the iPhone. Basically anything and everything that doesn’t have some kind of extra special power demands. Which is why this charger can also be used for a number of tablets, cameras, power banks, and so forth. It’s about 32” in length and 9.4” in height. 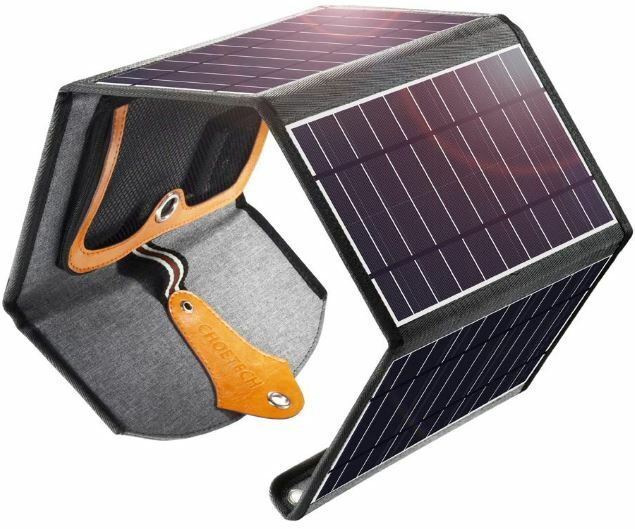 When fully collapsed and retracted to its smallest form, the solar charger measures about 6 x 8 – quite compact and highly portable. Like ordinary solar panels, the grid-based design of these panels are good for getting rid of heat. And the ultra-thin design makes it pretty ideal for a variety of different outdoor camping scenarios. When the solar panel has perfect lighting conditions, you can draw 24W from these panels. That’s 5V 2.1A or 2.4A. That means you can pretty much charge up any smartphone or tablet that doesn’t require some kind of special power requirement. Though not necessarily within the fastest speeds you’ll ever encounter. Compared to a wall charge under optimal conditions, you might be looking at a difference in speed of at least 30%. Moreover, solar panels can be tricky. Whether or not you’ll be able to get 24W literally depends on the weather. Though you can’t control the weather, you can try and plan for it. You can also control the angle at which the panels are facing the sun. Facing the sun directly will help them absorb far more energy than being at an odd angle. On occasion, these panels are portrayed as being used similar to a backpack. That’s a pretty preposterous idea. You don’t generally want the panel to be oriented in such an awkward way. You want them pointed right at the sun. When you can’t get them angled just right, and weather conditions aren’t suitable, then you’re going to have a wide variance in performance. Putting them on your back is just asking for terrible performance from your charger. The Choetech 24W charger includes a pair of carabiners. One is medium sized; one is slightly smaller. It includes a USB charging cable, and of course the solar panels themselves. It also includes an 18-month warranty. But the longevity of this equipment really depends on how well you take care of it. If you do take care of the panels, then you ought to be able to keep charging your devices for up to a decade. Perhaps a bit more. You’d just have to hope that your next mobile phone didn’t use something besides the standard 5V USB charging method. Who Should Choose the CHOETECH 24W Portable Solar Charger? The Choetech (Model SC005) 24W Portable Solar Charger has some niche uses. Someone who spends a lot of time away from wall outlets could certainly find some use from it. At least, provided they don’t live in northern Canada, or another region where the sun can be scarce for long periods of time. However, when you’ve got favorable conditions, this charger is downright impressive. The portability is fantastic. It’s easy to fold up and carry around, or otherwise store away. When it comes time for using it, these panels are large enough to charge two devices pretty swiftly. Yet the whole thing is small enough to carry with one hand. For someone who lives in the right area, this portable solar charger can certainly do an enormous amount of good. It’s really the portability that sets it apart, but the underlying panels are solid, too. And that makes the Choetech 24W Portable Solar Charger a good choice for someone who’s outside enough to take advantage of what it can offer.